The symbol used to denote partial derivatives is ∂. One of the first known uses of this symbol in mathematics is by Marquis de Condorcet from 1770, who used it for partial differences. The modern partial derivative notation was created by Adrien-Marie Legendre (1786), though he later abandoned it; Carl Gustav Jacob Jacobi reintroduced the symbol again in 1841. A graph of z = x2 + xy + y2. For the partial derivative at (1, 1) that leaves y constant, the corresponding tangent line is parallel to the xz-plane. 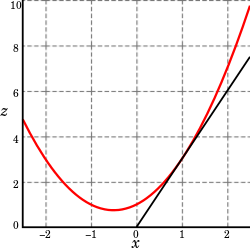 A slice of the graph above showing the function in the xz-plane at y = 1. Note that the two axes are shown here with different scales. The slope of the tangent line is 3. -plane, and those that are parallel to the yz-plane (which result from holding either y or x constant, respectively). is 3, as shown in the graph. Note that in this section the subscript notation fy denotes a function contingent on a fixed value of y, and not a partial derivative. This is the partial derivative of f with respect to x. Here ∂ is a rounded d called the partial derivative symbol. To distinguish it from the letter d, ∂ is sometimes pronounced "tho" or "partial". This vector is called the gradient of f at a. If f is differentiable at every point in some domain, then the gradient is a vector-valued function ∇f which takes the point a to the vector ∇f(a). Consequently, the gradient produces a vector field. by carefully using a componentwise argument. which represents the rate with which the volume changes if its height is varied and its radius is kept constant. The difference between the total and partial derivative is the elimination of indirect dependencies between variables in partial derivatives. Partial derivatives appear in any calculus-based optimization problem with more than one choice variable. For example, in economics a firm may wish to maximize profit π(x, y) with respect to the choice of the quantities x and y of two different types of output. The first order conditions for this optimization are πx = 0 = πy. Since both partial derivatives πx and πy will generally themselves be functions of both arguments x and y, these two first order conditions form a system of two equations in two unknowns. This equality can be rearranged to have differential quotient of mole fractions on one side. Partial derivatives are key to target-aware image resizing algorithms. Widely known as seam carving, these algorithms require each pixel in an image to be assigned a numerical 'energy' to describe their dissimilarity against orthogonal adjacent pixels. The algorithm then progressively removes rows or columns with the lowest energy. The formula established to determine a pixel's energy (magnitude of gradient at a pixel) depends heavily on the constructs of partial derivatives. 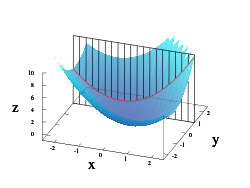 Partial derivatives play a prominent role in economics, in which most functions describing economic behaviour posit that the behaviour depends on more than one variable. For example, a societal consumption function may describe the amount spent on consumer goods as depending on both income and wealth; the marginal propensity to consume is then the partial derivative of the consumption function with respect to income. represents the partial derivative function with respect to the 1st variable. as long as comparatively mild regularity conditions on f are satisfied. There is a concept for partial derivatives that is analogous to antiderivatives for regular derivatives. Given a partial derivative, it allows for the partial recovery of the original function. will disappear when taking the partial derivative, and we have to account for this when we take the antiderivative. The most general way to represent this is to have the "constant" represent an unknown function of all the other variables. If all the partial derivatives of a function are known (for example, with the gradient), then the antiderivatives can be matched via the above process to reconstruct the original function up to a constant. Unlike in the single-variable case, however, not every set of functions can be the set of all (first) partial derivatives of a single function. In other words, not every vector field is conservative. Own and cross partial derivatives appear in the Hessian matrix which is used in the second order conditions in optimization problems. Triple product rule, also known as the cyclic chain rule. ^ This can also be expressed as the adjointness between the product space and function space constructions. ^ Miller, Jeff (2009-06-14). "Earliest Uses of Symbols of Calculus". Earliest Uses of Various Mathematical Symbols. Retrieved 2009-02-20. ^ Spivak, M. (1965). Calculus on Manifolds. New York: W. A. Benjamin, Inc. p. 44. ISBN 9780805390216. ^ Chiang, Alpha C. Fundamental Methods of Mathematical Economics, McGraw-Hill, third edition, 1984.